LED lighting offering some of the brightest (90 foot candles) light in NE Ohio. Check out the video. Looking for a high-powered game of tennis? A cordial evening of platform tennis? An energizing hour on the racquetball court? The Chagrin Valley Athletic Club is the place for all of the above, and more! With the Club's nine permanent indoor courts and ten outdoor tennis courts plus racquetball and platform tennis facilities, CVAC members enjoy racquet sports all year round and in any weather. 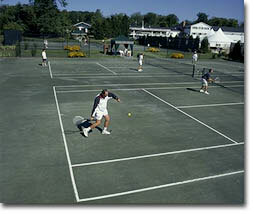 A full staff of tennis pros offers private and group instruction for all ages and skill levels. There are adult and junior clinics, social events, plus interclub leagues, CVAC leagues (intraclub) and United States Tennis Association (USTA) leagues. And after finishing a game or workout, relax in the clubhouse: its fireplace will be aglow in cool weather. Find all your equipment and accessory needs at the CVAC Pro Shop.